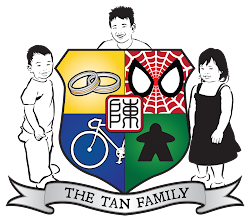 Tan Family Chronicles: His dream came true! 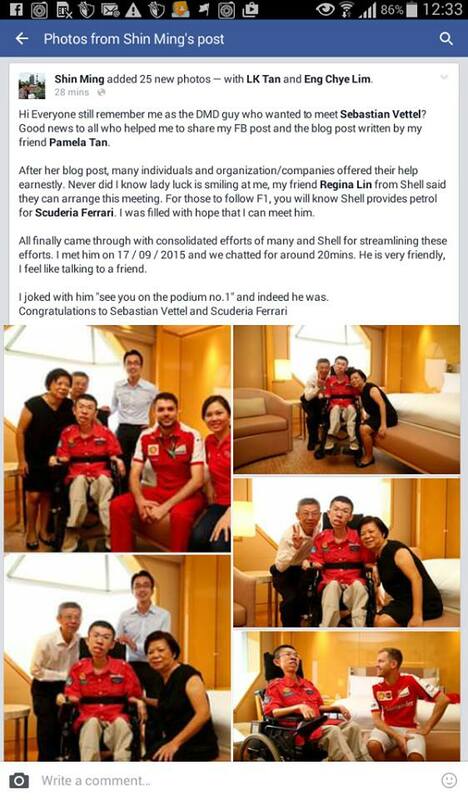 Remember our friend Shin Ming, whose dream was to meet Vettel? His dream came true! Below is a screen capture of what Shin Ming just posted on Facebook. 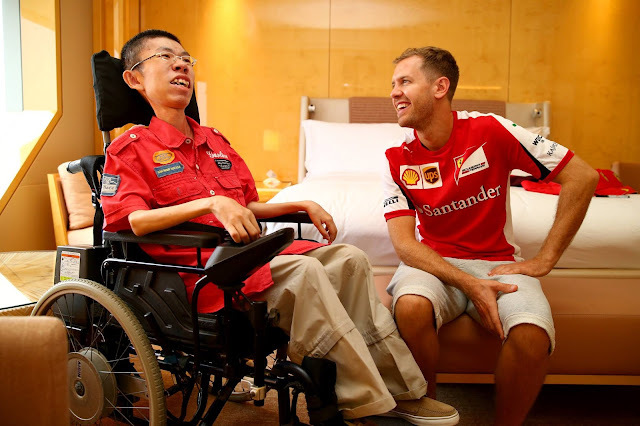 I posted the first blog post about Shin Ming's story and his dream of meeting Vettel about three weeks ago, on 31st August 2015. Within minutes, I had friends messaging me in private, saying that they have forwarded to friends they knew who had connections to the Singapore Grand Prix (SGP) and all the vendors working on the event. When I woke up in the morning, more messages greeted me on Facebook Messenger, on whatsapp, on sms. It was very heartwarming. Everyone wanted to help. Anyone and everyone who could help was helping. Soon, I started hearing the same message from many different people: "I sent to my friend, but she says senior management is already aware of this and is trying to do something about it." We even had people who had no contact with any of the companies associated with the annual F1 night race in Singapore trying to help by writing in to the press and to Singapore Grand Prix themselves. "I like him as we are both born in 1987. At the 2008 Italian Grand Prix, Vettel became the youngest driver in history to win a Formula One Grand Prix. 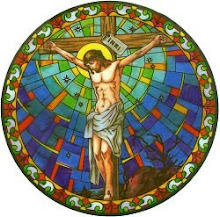 He was then only aged 21 years and 74 days. I am impressed that someone my age can achieve so much. This gives me the courage and motivation to achieve more. Do you know he won the Abu Dhabi Grand Prix from pole again, to take the Drivers' Championship lead for the first time in his career and became the youngest world champion in the sport's history? This really made me believe that age isn't a limiting factor in achieving great things. The podium finishing Japan Grand Prix secured his second successive title with four races remaining, making him the youngest ever double world champion and also the youngest back-to-back champion. At this point in time, when he won his second successive title, I particularly looked up to him. I can honestly say that I idolize him. 2012 was Vettel's third consecutive championship, and at age 25 he became the youngest ever triple world champion. Again, I was totally impressed by this. Vettel sealed his fourth world title at the 2013 Indian Grand Prix on 27 October. I was by then convinced that everyone can achieve great things in their own ways or areas. In fact, he has set many records for being the youngest driver to achieve many things. Young, doesn't mean you can't achieve." He had me at "We were both born in 1987." They were the same age! Shin Ming admitted to me before, that that was one of the first things that particularly drew his attention to Sebastian Vettel - they were of the same age; both were 28 years old this year. It spoke volumes to me that Shin Ming would be so enamoured with Vettel. It is almost as it Shin Ming were living a life of achievement and excitement vicariously, through Vettel. It struck me how positive Shin Ming was. He chose to be happy for his idol, that his idol could be successful in his field even though he was the same age as him. Shin Ming did not choose to be bitter at not being able to even drive a normal car, much less a racing car. He did not allow the bitterness to eat away at him inside. Instead, he allowed the wonder and the success of a fine young man like Sebastian Vettel, to inspire him and light up his life. 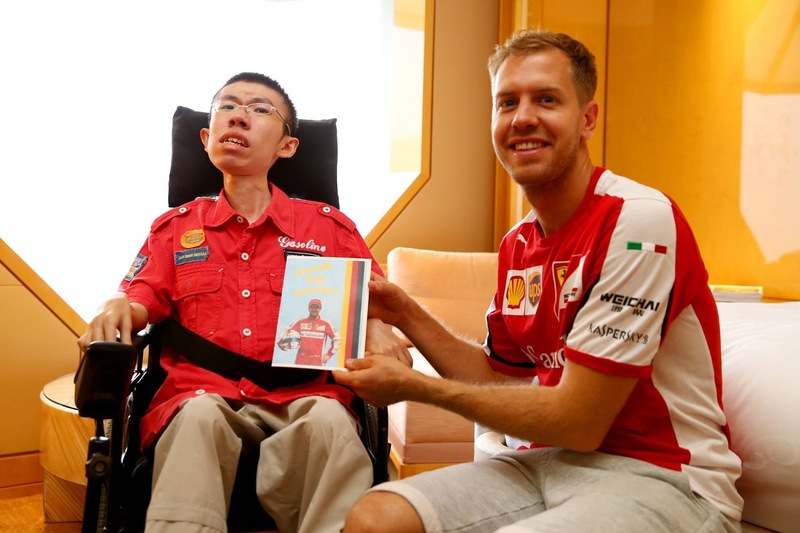 Shin Ming has his dream of meeting Sebastian Vettel come true! Many of the organisations having dealings to do with the race, all wanted to help. From the external security vendor Horus-i to Singapore Grand Prix themselves and many other parties who modestly declined to be named - all wanted to help in whatever way they could. The request was escalated to their respective senior management who helped it along in however they could but almost all requests came to the same juncture - it all rested on the decision of Vettel and/or Ferrari. Being unsure of the outcome of the request (since the decision lay with Vettel/Ferrari and no one else), all these parties tried their best, within their ability to offer whatever they could to Shin Ming. One company offered to buy Shin Ming and his parents tickets to the best hospitality suite there was. Another company offered to give Shin Ming a tour down on the tracks itself, where he would be able to come up close to see the race cars themselves. Another managed to get Shin Ming an cap autographed by Vettel himself. Truly, it is heartwarming to know of how everyone who knew Shin Ming's story tried to help. In the end, it was a contact from Shell who is the fuel sponsor of Ferrari Scuderia - Sebastian Vettel's team, that managed to engineer a private meeting between Shin Ming and Vettel. Being the humble, and highly private man that he is, Vettel did not want to have any media involved in the meeting. Shin Ming told me that his dream was about to come true, but swore me to secrecy, allowing me to only inform those who were actively still working on the request. He said to thank everyone who tried to help him, that he really appreciates it. Then, he told me he was trying to learn to speak a bit of German right now, in preparation for his meeting with Vettel. It was obvious how excited he was to have his dream come true. Shin Ming, Sebastian Vettel and the card Shin Ming made for Vettel. On Thursday, 17th September 2015, just days before the Singapore Grand Prix, Shin Ming got to meet his idol. "I finally got to meet Sebastian Vettel. I asked him if I could try speaking German to him and hope he can understand me. I said "Willkommen in Singapur, schön dich zu treffen, ich bin Shin Ming”. I asked him if he knew what I just said. He nodded and said that I just I welcomed him to Singapore, said nice to meet him and told him my name. He said my greeting in German was not bad, and asked where I learnt it. I said I learned it from Google. I asked him why he agreed to meet me? He replied that it is a pleasure in doing so, since I am here (in Singapore). I asked him what time he woke up, he said I woke not too long (my guess is 2-3pm, time was around 5pm). He told me he was trying to adjust from Europe time to Singapore time. I told I had something for him. He said "Oh you shouldn’t have!" 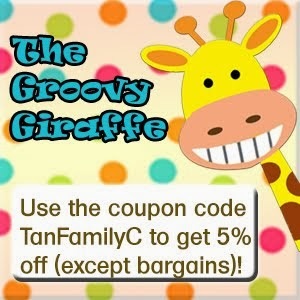 and proceeded to pick up my thank you card. I asked "Do you like it?" He said "Yeah!" He read my message where I mentioned that we were the same age, born in the same year. He asked he when my birthday was. I told him mine and he replied "Oh I am older!" even though we were just born months apart. Then the photo taking started. I prepared an extra copy for him to autograph so that I could keep it as a memento. I used my instant camera so the photos can be pasted on his card. We chatted about other things too. I told him we had Sunday tickets for the race. He asked where we were sitting at - the Empress Place but I was not sure which turn it was. He thought awhile and said it was probably Turn 10, I will need to take a look later to memorize the circuit. I said "Yeah, 23 corners 61 laps. I asked him how you do you memorise the circuit, cycle?" He said "I would walk." He looked at my wheelchair and asked how fast I drive? I said only 6kmh, not like you going at 300kmh. I even joked with him "With the time I take to do a lap, you would have done 30 laps!" We then spoke about the heat in Singapore, and I told him that I hope the haze would not be so bad on Sunday. I asked him if was aware about the changes to Turns 11 to 13, to which he replied "Yeah, I know about it, it is changing to other side of the road on Anderson Bridge, but I'm not sure why they change it." I jokingly said "It was to make life difficult for you guys." I told him "I will be watching this Sunday, and I hope you would be on the podium No. 1! He smilingly said "No pressure." 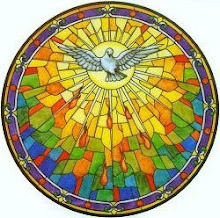 Throughout the meeting I find Sebastian to be very friendly and I can interact with him comfortably like a friend does. It didn't feel like two strangers meeting for the first time. It's like we were friends. Sometimes if you belief in your dreams, it may really happen. I thought it was a crazy and desperate thing for me to post on Facebook about my dream. I never expected that there would be people like you and all these other people, who would actually want to help me. So I think, if you have a dream, you should try to chase it. Never try never know." 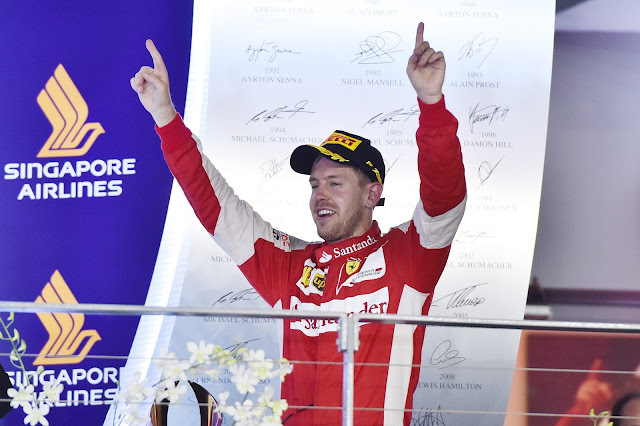 On the 20th September 2015, Sebastian Vettel emerged victorious on the Marina Bay Street Circuit of the Singapore Grand Prix, leading the race from start to finish, at a total time of 2 hours 1 minute and 22.118 seconds. This is his 4th win in Singapore, having previously won the night race in 2011, 2012 and 2013. Personally, I am not an F1 fan. So even though Sebastian Vettel won the Singapore Grand Prix three times in a row from 2011 to 2013, I have never heard of the name "Sebastian Vettel", until Shin Ming said that he wanted to meet him. However, now, I will remember the name Sebastian Vettel for life. I will remember the man who was kind enough to agree to meet a young man he doesn't know. The man who is so humble and unassuming that he did not want to have the media around when he met Shin Ming. To me, he was a winner even before the race started. For he has won the hearts of Shin Ming and all the rest of us, people who have been praying for Shin Ming to have his dream come true. From the bottom of all our hearts, thank you, Sebastian Vettel. Oh, and by the way, congrats on being the winner of Singapore Grand Prix 2015! My heart broke when I read Shin Ming's first reason for why he likes Sebastien Vettel.